SKILL LEVEL REQUIRED:This course is a beginner, introductory core course. 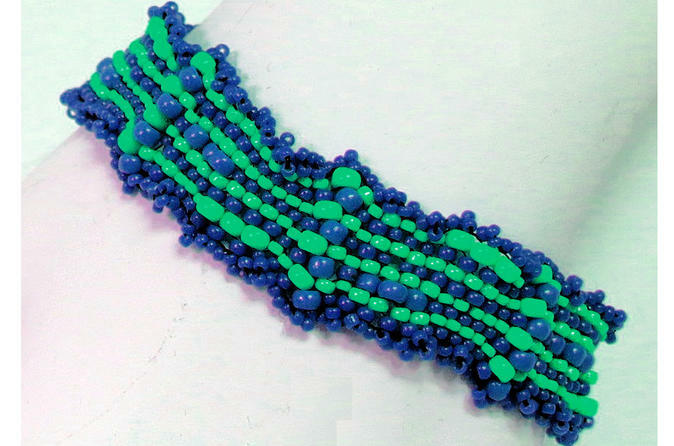 We practice 3 popular bead weaving techniques - Square, Flat Even-Count Peyote, and Right Angle Weave. We go over instructions for making bracelets using these three stitches. Students begin one of the three projects during class. To empower the beginning bead weaver with management and control insights about selecting materials, learning the pros and cons of different bead weaving stitches, and implementing three popular stitch techniques - Square, Peyote and Right Angle Weave. In addition, instructions for 3 bracelet projects are provided, one of which may be begun during the class.